At a time when so much of IPL happened in Court and on a day when India is playing Bangla, one may not read anything else …. Still I read the news of Virender Sehwag striking a scintillating 88 ball century which helped MCC beat Durham in the English county season curtain raiser in Abu Dhabi couple of days ago. The MCC skipper led from the front, hitting 18 fours and a six in his knock of 109 as he steered his team to a six wicket win. The four-day day-night match also featured the use of pink balls which were recently trialled in the Australian Sheffield Shield. It therefore grants Sehwag the distinction of becoming the first Indian to hit a hundred in a first class match with a pink ball being used. Recently, I had posted about the ‘glittering stumps and bails’ when broken – of the technology of LED lights flashing bright red assisting adjudication of run outs and stumpings …….. Remember seeing Kamal starrer ‘Apoorva Sagodharargal’ at Courtallam in 1989……. In the film directed by Singeetham Srinivasa Rao, . Kamal played three roles – one of which was ‘Appu’ a dwarf circus clown. Appu revenges his father’s killers of whom Nallasivam is killed in a golf course using a tiger from his circus; Nallasivam's caddy sees Appu’s face and the tigers tail from afar. This leads the inspector to the other Kamal (Raja) who, coincidentally is wearing a tiger costume while performing a song at a festival in his street. Perhaps that was our first knowledge of Golf …… the balls used in Cricket / Hockey / Football / Tennis are all different and for Golf, there is a special ball. Golf is a precision club and ball sport in which competing players (or golfers) use many types of clubs to hit balls into a series of holes on a course using the fewest number of strokes. The game in general played on arranged progression of either nine or 18 holes. Each hole on the course has a tee box to start from. Golf competition is generally played for the lowest number of strokes by an individual, known simply as stroke play. Under the rules of golf, a golf ball weighs no more than 1.620 oz (45.93 grams), has a diameter not less than 1.680 in (42.67 mm), and performs within specified velocity, distance, and symmetry limits. They have dimples all over – the reason is one of natural selection. Originally, golf balls were smooth; but golfers noticed that older balls that were beat up with nicks, bumps and slices in the cover seemed to fly farther. Every sportsman would obviously go for the advantageous thing – so they became standard ! ~ as the nicks and cuts were acting as "turbulators". In golf, a caddy or caddie is the person who carries a player's bag and clubs, and gives insightful advice and moral support. Unlike a day-night Cricket match, golf cannot be played in dark – as sighting the ball and the hole would not be possible…….. not any longer – going by this interesting newsitem in Daily Mail. 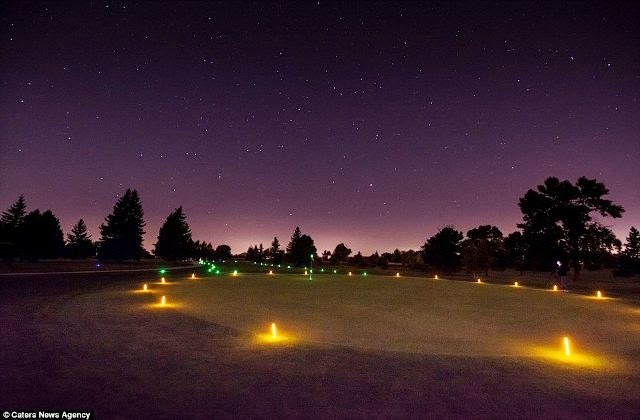 Keen golfers can now play until the early hours of the morning - thanks to these amazing light-up golf balls. The LED-infused balls light up in one of four colours when they are hit and stay lit for eight minutes while players plan their next move. 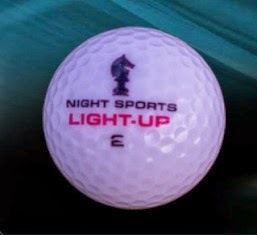 They are the brainchild of U.S. company Night Sports USA which also produce light-up tees, fairway yardage markers and flags. Experts at the company insist they play exactly like a standard golf ball except they float in water so can be retrieved. A spokesperson said: 'The balls provide the high performance aerodynamics, control, accuracy, feel and distance you expect from a professional quality ball. 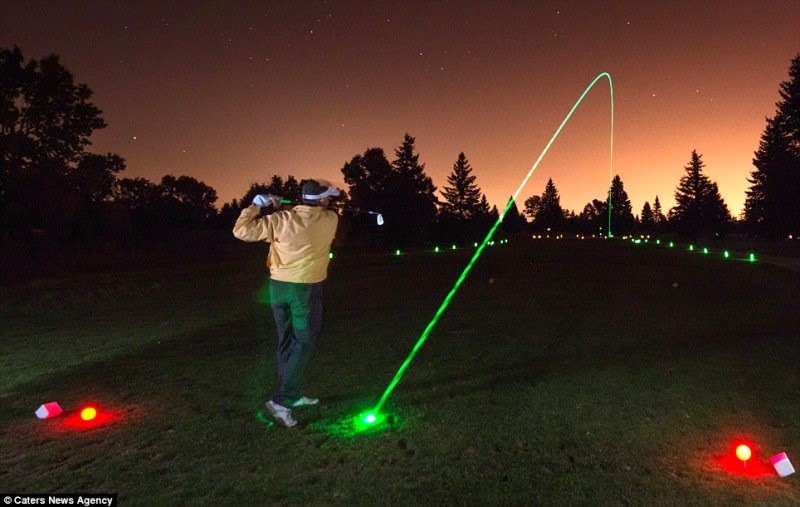 'We developed night golf as a fun, innovative way of furthering existing player's game - and also for a bit of fun. 'There are twice as many night time hours as there are day time which makes night time golf perfect.' The balls, which each have a 40-hour battery life, are available online with a four-pack costing £18.